First and foremost, thank you to everyone that has secured a 2017 Breyer presale through us! We appreciate your support more than words could ever express. We just discovered that the Breyer 1769 Bandera Symbols of the West Ranch Horse was not included in our initial order as we had thought. We are offering customers with an existing order for Bandera the option keep your existing order or to cancel Bandera. If you choose to wait for Bandera, the rest of your order will be held for shipment until he is in stock. We will happily reserve a Bandera if you choose to cancel and you will have the first option to purchase him when he is in stock. We do not have a firm ship date on Bandera but we believe that it will be sometime in March. We have been tracking our Breyer Freight shipment and it has an ETA of Friday, February 10th. It is 3 pallets of Breyer Horses weighing almost 750 pounds, yikes! Our last Breyer order arrived a day early but you never can tell with freight! 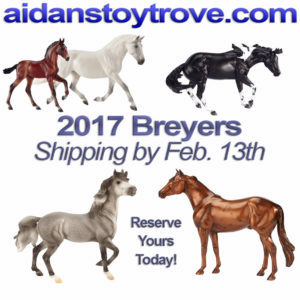 We are still on track for shipping all of our 2017 Breyer orders out on Monday, February 13th!! 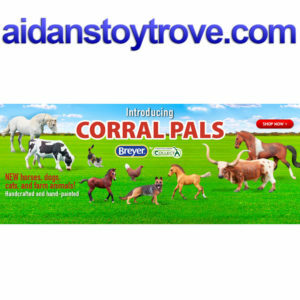 We do have a rather large herd of Breyer Corral Pals that our coming with our initial order. If there is one in particular that you are looking for, please email us at aidanstoytrove@gmail.com. We can tell you if we will be receiving that particular Corral Pal or Corral Pals with our initial order. If we won’t be receiving it, we can add it to our next order. As mentioned in passing before, we will be vending at BreyerWest 2017 and will be bringing all of the 2017 Breyers that we have in stock 🙂 I will be making another blog post about BreyerWest. Please stop by our booth and say hi if you will be attending! 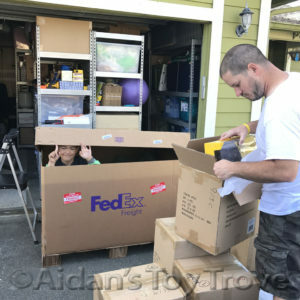 « Aidan’s Toy Trove New Mail Call Video Series!